Placing communications satellites at certain distances from stars where the massive bodies' gravity bends and focuses radio waves might enable us to communicate with far-flung space probes, distant colonies and even aliens. Our own sun might represent the best communications device around, if only we could harness its power, scientists say. If the sun's gravity could be used to create a giant telescope, people could send and receive intensely magnified signals that could allow us to call an alien civilization, some researchers propose. According to Einstein's general relativity, the sun's behemoth mass warps space-time around it, which actually bends light rays passing by like a giant lens. If a detector was placed at the right focal distance to collect the light, the resulting image would be extremely magnified. The only catch is, the nearest focal point is about 550 times the distance between the Earth and the sun. Nonetheless, eventually harnessing this power might enable Earth to view distant objects, communicate with interstellar probes, and even contact aliens, scientists say. The technique could be applied to optical light, or longer-wavelength light in the radio spectrum, for example. 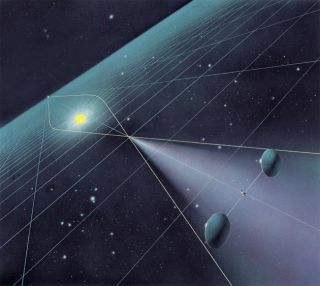 Plus, an even stronger network could be created by placing relay spacecraft near other stars to form "radio bridges" across the great voids between stars that weaken and distort cosmic communiqués. "If we use the sun as a gravitational lens, then we can keep in touch with our own probes even at considerable interstellar distances," said Claudio Maccone, technical director of the Paris-based International Academy of Astronautics, and author of a new study on the mechanics of the proposed technique. "This is key to exploring the neighborhood of our galaxy in the centuries to come," he said. And alien civilizations might have already discovered this means of long-distance calling, Maccone said. If so, we might be able to intercept their messages. The research was detailed in a recent issue of the journal Acta Astronautica. To guide NASA rovers on Mars or to tell the Cassini spacecraft to snap pictures of Saturn, scientists rely on the U.S. space agency's Deep Space Network. The network's antenna arrays pack enough power to keep astronomers in contact with the twin Voyager probes some 10 billion miles (16 billion kilometers) from Earth and flying through our solar system's edge. As far as that might sound, it is small potatoes when compared with the span between the sun and its nearest stellar neighbors, the triple-star Alpha Centauri system, located 4.37 light-years, or around 26 trillion miles (41 trillion km) afield. Communicating with aliens that far away, or even with our own spacecraft sent on distant missions, is a real issue. Over these celestial distances, our electromagnetic communications signals grow feeble and garbled by ambient "space noise," such as the cosmic microwave background radiation, the relic heat signature from the birth of the universe 13.7 billion years ago. This interference could scramble half of the information exchanged between us and intrepid, Alpha Centauri-bound explorers or probes in the future, according to Maccone's calculations. So even if humankind went star-hopping, staying connected might be impossible, Maccone said. "For interstellar missions, the number one problem we normally face is that we don't know how to propel a spacecraft that far," Maccone said, yet "communication is equally important." To set up a radio bridge, we'd need to start placing a relay satellite at the minimum distance from the sun where bent light could convene at a focal point – about 550 times the distance between the Earth and the sun, or 550 astronomical units (AU). Then, on the receiver side of things – Alpha Centauri, say – a second relay station would be established to boost incoming and outgoing signals. For the biggest Alpha Centauri star, which is a shade more massive than the sun, the minimal focal distance turns out to be 749 AU from that star. With these relays in place, the error rate between the two points would drop from 1-in-2 to 1-in-2 million – on par with the accuracy achieved by the DSN in our local solar environment. Shockingly little transmitting power is needed, too: just one-tenth of a milliwatt, or several orders of magnitude less than the DSN's antennas, Maccone found. Maccone also gauged the focal points and transmission strengths for two other nearby stars: Barnard's star, a small red dwarf, and Sirius, a blue giant, which are located 5.6 and 8.6 light-years from Earth, respectively. While it may be many eons before humankind ever projects itself 26,000 light-years into the core of the Milky Way, and even longer to reach the Andromeda Galaxy 2.5 million light-years away, Maccone showed that radio bridges could enable far-flung correspondence. Bob Cesarone, strategy development manager for the DSN at NASA's Jet Propulsion Laboratory, who was not involved in the study, calls Maccone's two-way interstellar radio bridge "a very provocative concept." Cesarone said that such a system might well succeed the current DSN, though optical frequencies — lasers, that is — look like a nearer-term solution for what is at any rate a problem that humanity won't have to deal with for decades. Is ET phoning (our) home? If an advanced alien civilization has wired up the stars via gravitational lensing, Maccone said, the ongoing extraterrestrial-seeking SETI (search for extraterrestrial intelligence) program could attempt to eavesdrop on the conversation. Earth would have to lie in the line-of-sight between the two fixed endpoints of the listening posts, which is a drawback to deploying such a telecommunications system in the first place. But if aliens have spotted our solar system with its appealingly habitable inner planets, they might drop us a line, Maccone said, albeit a less energetic one than SETI normally looks for. "Now that we know that stars are very powerful lenses, we might expect that alien civilizations could transmit with much lower power if they know roughly where we can possibly be," Maccone said. Nevertheless, engineers would have their hands full in rolling out a gravitational lensing interstellar radio network. For starters, relay stations would have to remain precisely aligned with respect to each other and their stellar amplifiers over extreme distances, Maccone said. This will require revolutionary celestial navigation and orientation systems, such as a galactic GPS powered by pulsars. And although these radio bridges might help us keep in touch, the Einsteinian universal speed limit of light (and therefore information) means that a dialogue would take a very long time anyway. Given the distance, a message relayed between a colony on an as-yet-undiscovered habitable world at Alpha Centauri, "Avatar"-style, would have a round-trip time of nearly nine years. "At this moment, there is no solution to the problem of the [time] delay," Maccone told SPACE.com. "But the good news is that now we have a reliable way to communicate across interstellar distances."